Database Administrators usually use the sp_renamedb system stored procedure to quickly rename a SQL Server Database. However, the drawback of using sp_renamedb is that it doesn't rename the Logical and Physical names of the underlying database files. It's a best practice to make sure the Logical Name and Physical File Name of the database is also renamed to reflect the actual name of the database to avoid any confusion with backup, restore or detach/attach operations. Now let's rename the CoreDB database to ProductsDB by executing the below T-SQL code. Your output should look something like this from the above query. You can see in the above snippet that the Logical Name and File Name in the DB File Path column for ProductsDB are still reflecting the old name of CoreDB. This is not a good practice to follow in a Production Environment. Below you will see the steps which a DBA can follow to rename the database and its respective files. DBAs should follow the below steps which will not only rename the database, but at the same time will also rename the Logical Name and File Name of the database. This first set of commands put the database in single user mode and also modifies the logical names. This is the output from the above code. Now we need to detach the database, so we can rename the physical files. If the database files are open you will not be able to rename the files. Once the CoreDB database is detached successfully then the next step will be to rename the Physical Files. This can be done either manually or by using the xp_cmdshell system stored procedure. You can enable xp_cmdshell feature using the sp_configure system stored procedure. Once xp_cmdshell is enabled you can use the below script to rename the physical files of the database. In this article, we will see about fixed database roles in SQL Server. As the name suggests, fixed database roles cannot be removed or modified and performs specific administrative tasks as it has pre-defined set of permissions. You need to be very careful while assigning these roles and assign these roles only when there is a serious requirements. You can execute the sp_helpdbfixedrole system procedure to get the list of fixed database roles. All the members of db_owner fixed database roles can perform all the maintenance activities and setting configurations. This role should not be given to regular users and should be assigned very carefully as it can perform almost all the operations in a database. As the name suggests, all the members of db_accessadmin can handle access related issues. This role controls security, grants access, revokes access for logins to enter database. This role is rarely used as these operations are performed by DBAs as he has relevant fixed server role. Members of db_securityadmin role manages all the permissions and security related activities. As database administrators usually manages security, permissions, role membership etc. so this role is hardly assigned and used. You should not assign this role to regular users. If any member is assigned with db_ddladmin role then he can perform all DDL operations and can execute, create, drop and alter any objects. Normally this role is assigned to developers to perform the related operations in application. This role is usually not assigned to regular users as he can misuse the DDL operations. 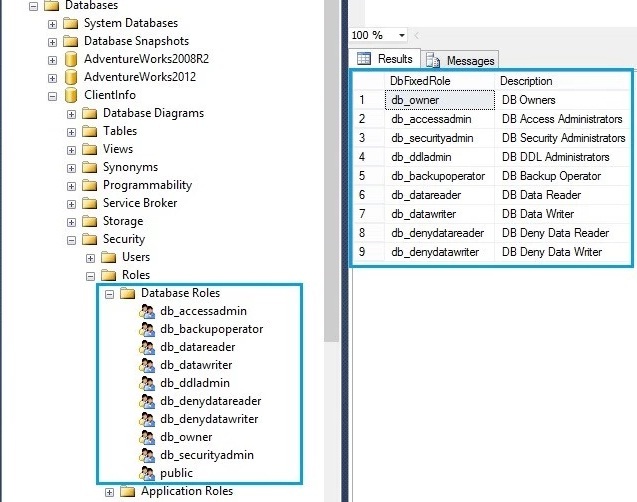 db_backupoperator role can perform the database backup operations. This role is rarely used as backup activity is a role of database administrator and he has much higher permissions rather than using this specific fixed database role. If any user is requesting for SELECT permission on database tables then you can tag him with db_datareader fixed database role as this role allows a member to perform SELECT operations on database tables and views and tagged member will not be able to modify any object. This role is mostly assigned to developers and regular users who need table access on production database. All the members of db_datawriter fixed database role can perform INSERT, UPDATE, DELETE operations on all tables and views in respective database. This role is basically assigned to developers to perform operations on QA servers. Testing applications sometimes require this role. As the name suggests this role doesn’t allow to read data from tables in a database. So user will not be able to perform SELECT operations on a table or views. I haven’t used this role any time and also never seen members assigned with this role. This role is basically opposing db_datawriter role which means members with this role will not be able to perform INSERT, UPDATE or DELETE operations on tables and views. Again as a DBA I have not used this role yet and never seen anyone using this role. 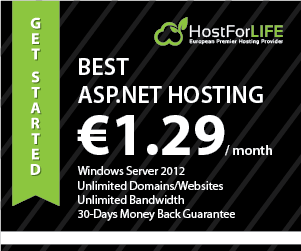 SQL Server 2012 Hosting Belgium - HostForLIFE.eu :: How to Fix Distribution setup SQL Server Agent error: "RegCreateKeyEx() returned error 5, 'Access is denied.'" ? With this short article, I will tell you about How to Fix Distribution setup SQL Server Agent error: "RegCreateKeyEx() returned error 5, 'Access is denied.'" on my SQL Server 2012 Hosting. 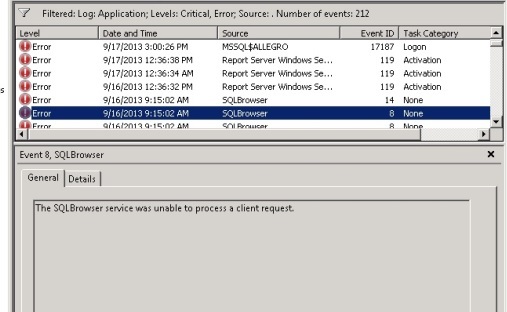 An error occurred configuring SQL Server Agent. This is a very minor error, and not difficult to work around at all. 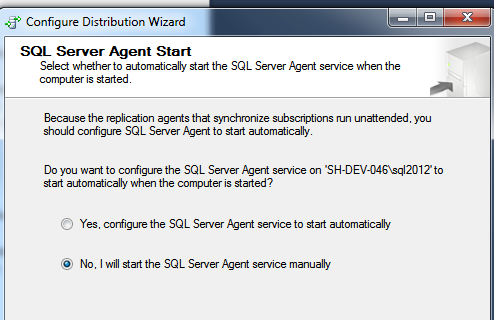 The wizard is making an attempt to alter the SQL Server Agent service "Start Mode" to Automatic. you'll be able to try this via the SQL Server Configuration Manager instead. In the Sysinternals method Monitor, you'll see: Operation: RegCreateKey Result: ACCESS DENIED Path: "HKLM\System\CurrentControlSet\Services\SQLAgent$SQL2012"
If you encounter this error, choose "No" in the "SQL Server Agent Start" page in the configure Distribution Wizard (as shown below), so set your agent service to Automatic start Mode via the SQL Server Configuration Manager. The third step of the wizard that failed before won't happen. Why the failure truly happens I didn't figure this out, and i am open to feedback, however this seems like a vestigial step to a wizard that otherwise has no negative impact. Running SSMS with "run as Administrator" doesn't seem to fix this error either. i would like to recognize why this error happens within the 1st place. Today I had a problem with a table that has around 5 million records on my SQL Server 2012. The table has as primary key “Header No.”,”Transaction No.”. In the table is a field “Order No.” that at the moment is blank for all records. I also had an index on that field, because I will need to search for it. I think that in the future only 1 in several 1000 records will have an order no. So the index will be highly selective because I will have only 1 record per order no. It should go lightening fast but it takes almost 1 second for each FINDFIRST. WHAT? A CLUSTERED index Seek????? it should have been an index seek. 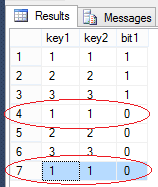 But because SQL knows that the Field “Order No.” contained only blanks, it decided to do a clustered index seek because of the ORDER BY (at least this is what I think SQL decided). So how to fix it NOW (I don’t want to wait that it goes into production and it takes days or months before the problem fixes itself. What is the code for? The FINDFIRST serves because I want the Invoice No. of that record and it has to be a non-blank value. So, I changed the index from “Order No.” to “Order No.”,”Invoice No.”. It makes the index a little bigger, but it shouldn’t be a big problem (or at least I hope so). Even with all blank values in “Order No.”,”Invoice No.” at the moment, SQL has changed its plan to an index seek and the code has become very fast. Recently one of my application website went down. I checked all the basic connectivity troubleshooting on my SQL Server 2012 Hosting and seem everything was looking and working fine. Finally, I found the problem with the browser service but that’s also in running state. The quick solution is rebooting the SQL browser (Start –>All programs–>Microsoft SQL server 200X–>Configuration tools –>SQL server configuration Manager) without rebooting SQL service. I searched and found a couple of MS links (KB-2526552 And SQLBrowser Unable to start) but, I did not apply it. I used another way that is also a permanent fix. For me it’s a named instance and listening a dynamic port and DBAs knows the browser service is mainly for named instance. From the local machine we can connect the server through SSMS by using server name and server name + port number. But, other than local machine you cannot connect the server by using server name. (You can test that by connecting some other server or better install only SSMS on the application server and try to connect it) so I went to the application server and opened a connection string as expected the data source only has the server name. So We changed it from Datasource “from Data Source=Servername\Instance to Data Source= Servername\Instance,port” Ex: Muthu1\SQL1,5432. Application team made a standard to always include a port number in the connection string block i.e. FQDN. - Check you have any alias/DNS name. SQL Server 2012 introduced a new function called CONCAT that accepts multiple string values including NULLs. The difference between CONCAT and (+) is, CONCAT substitutes NULLs with empty string, eliminating the need of additional task for handling NULLs. Here is the code. If you were unaware, make sure you use CONCAT with next string concatenation for better result. However, remember that CONCAT substitutes NULLs with empty string which is varchar(1), not as varchar(0). There are plenty of tutorials out there that explain how to configure an MS SQL Server alias. However, since none of them worked for me, I wrote this post so I'll be able to look it up in the future. Here's what finally got it working for me. In my development team at work, some of our local database instances have different names. Manually adapting the connection string to my current local development machine every single time is not an option for me because it's error-prone (changes might get checked into version control) and outright annoying. This is the perfect use case for an alias. Basically, an alias maps an arbitrary database name to an actual database server. So I created an alias for FooBarSqlServer, which allows me to use the above (unchanged) connection string to connect to my local (differently named) SQL Server instance. That was when I ran into the trouble motivating me to write this post. The alias simply didn't work: I couldn't use it to connect to the database, neither in our application nor using SQL Server Management Studio. 1) Open the SQL Server Configuration Manager. 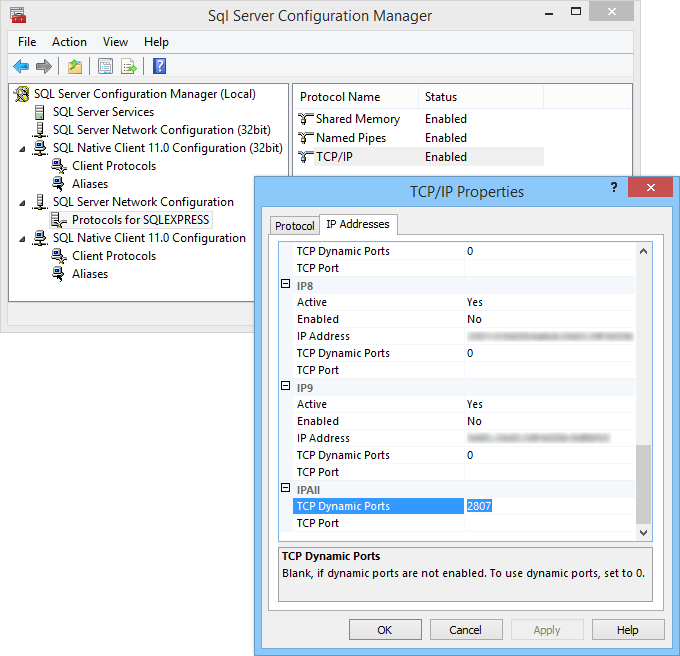 2) Expand SQL Server Network Configuration and select Protocols for <INSTANCE_NAME>. 3) Double-click on TCP/IP and make sure Enabled is set to Yes. 4) Remember whether Listen All is set to Yes or No and switch to the IP Addresses tab. - Now, if Listen All was set to Yes (which it was for me), scroll down to the IPAll section at the very bottom of the window and find the value that's displayed for TCP Dynamic Ports. - If Listen All was set to No, locate the value of TCP Dynamic Ports for the specific IP address you're looking for. You'll have to copy this port number into the Port No field when you're configuring your alias. Note: that you'll have to set the Alias Name to the exact value used in your connection string. Also, if you're not using the default SQL Server instance on your development machine (which I am), you'll need to specify its name in the Server field in addition to the server name. In my case, that would be something like YourDirectory\NAMED_SQL_INSTANCE. Remember to also define the alias for 32-bit clients when your database has both 64-bit and 32-bit clients.